Happy St. Patty’s Day! Are you wearing green? I sure am because I know that even from a distance I could be pinched by someone hired by my family. Wearing green is one of those traditions that we follow. We have shamrock pins. No green, you get pinched. You could always tell people that your underwear is green and hope they aren’t the type of weirdo to ask to see it. If your underwear is green for any other reason beyond the fabric color, gross, wash them. Maybe when Greg gets home from his St. Louis trip today, we will drink beer (no green beer-that’s a travesty). Greg is partially Irish (part o’ his beard is red but not as red as his sister’s hair-hey, Leslie). His great grandparents were from Ireland and his great grandpa made shoes (that’s what his grandma told me, rest her soul). I do love dancing jigs and shoes catered to my feet would’ve been like dancing on pillows (in my mind). Personal tidbit of the day: When I was in first grade, I learned to spell leprechaun to a Christmas tune for a bonus word on the spelling test. If you see me, ask me to spell leprechaun and you will hear me sing it. I won’t even hide that I tried to make soda bread (but that seems to be up for debate whether or not it stems from Ireland or not), from a Bon Appetit recipe, in the current issue. The recipe was supposed to be authentic Irish inn food but the outside was hard and the inside was still dough and it did not smell like bread. I was disappointed and again, I wasted ingredients, a whole lotta ingredients. Thanks, Bon Appetit…I usually trust you. Moving on to the topic du jour (trumpet sounds)-pantry staples post number two. Continued from yesterday’s post about my cabinet staples. Today includes herbs and fridge must-haves at my place. 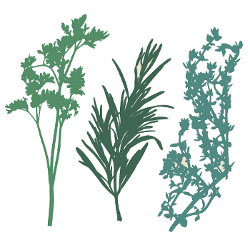 Fresh: *rosemary, thyme, *cilantro, basil, parsley – I love fresh herbs in almost anything and I am a cilantro nut; we grow our own herbs. *Soy sauce/ginger paste (or fresh ginger)/sweet chili sauce/curry paste/*Worcestershire sauce/*Dijon mustard/*jelly/*maple syrup – We have a lot of condiments beyond this. *Dill pickles -I am partial to Bubbies and Clausen. Soba noodles- I like Melissa’s yakisoba noodles in the produce section of my store; they whip into an easy stir-fry in a few minutes. Join me tomorrow for my last pantry post, the freezer. How fun! I learned a little about you and your pantry. What a great post.